Electrolytic boilers | Destila s.r.o. Electrolytic boiler for brewer fully replaces the steam boiler and is used for brewers with the production capacity of 10hl/batch. Because the entire heating system is unpressurised, it can be used where the steam generator and pressure steam boiler deployments are incompatible with standards or can not be met by the requirements of these standards for objective reasons. Electrolytic boiler has a capacity of 38 or 75 kW and uses 150 ° C heat oil. 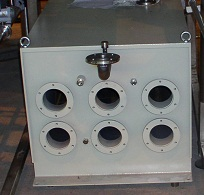 An oil pump which ensures pumping into a container duplicator and the hot water heat exchanger is a part of a systém. Boiler operation is controlled automatically.